A Day for Scotland, Stirling 1990, originally uploaded by Scottish Political Archive. In the early 1990s the Campaign for a Scottish Assembly and other groups sought to use public events to keep the issue of devolution in the limelight. The first of these was ‘A Day for Scotland’ held in Stirling in the summer of 1990. This music event was organised by Stirling Council and the Scottish Trades Union Congress (STUC). 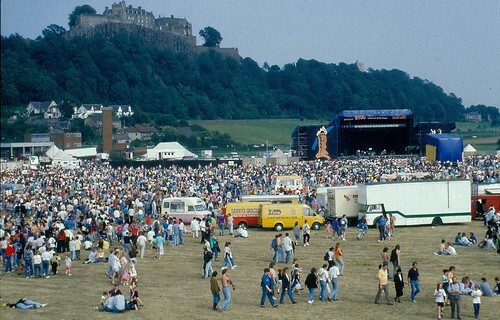 It was attended by approximately 38,000 people and featured bands such as Runrig, Hue and Cry and Deacon Blue. The success of this event led to other music events and rallies. Photographer, John McPake. Image courtesy of the Stirling Smith Art Gallery and Museum.